What if a Supreme Court decision in 1940 had made women subject to the draft and eligible for enlistment in the military? That is the simple idea behind FRONT LINES. What if women had gone to war - into combat - alongside the men? I use this approach as a lens to look at America’s role in World War 2. World War 2 may be the single biggest event in modern history. It was slaughter on a scale the world had never seen before and thankfully has not seen since. To put it into perspective, the entirety of the tragedies in Iraq and Syria would have been a minor sideshow in WW2. In the Battle of the Bulge alone, 19,000 Americans died in just 41 days - almost three times the total US deaths from the Afghanistan and Iraq wars. But statistics don’t really tell the whole story. For that you need people - characters. 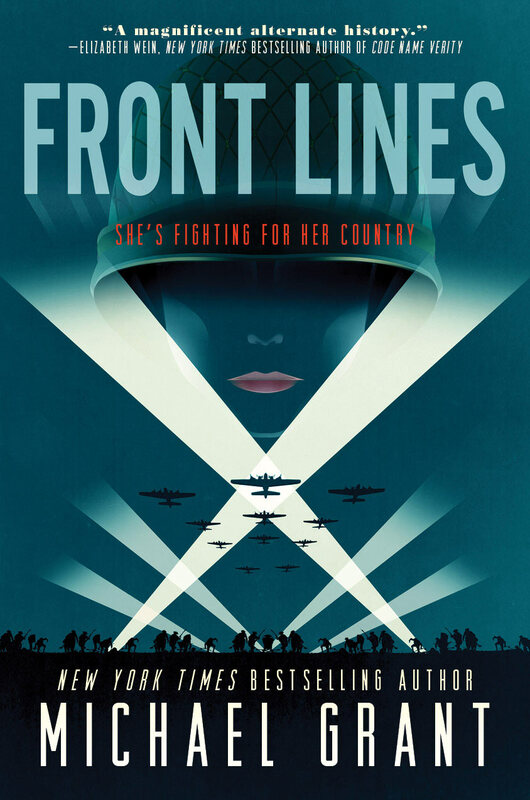 So in FRONT LINES I follow three young women - girls, really, when the war starts - from enlistment, though training, and into the heart of war. Rio Richlin is a 17 year-old white girl from a small town in northern California. She has no superpowers, she is not noticeably special in any way, but she will grow to become an effective combat soldier. Frangie (Francine) Marr is a black girl from Tulsa, Oklahoma, a city with a terrible history of racism. She likes animals, wishes she could grow up to be a doctor, and spends the war as a combat medic, saving lives amidst slaughter. Rainy (Elusheva) Schulterman is a Jewish girl from New York who wants to do all she can to stop Hitler. She will offer her penetrating intellect and talent for languages to army intelligence as an analyst and a spy. In conceiving FRONT LINES I didn’t want a simple rah-rah we’re-number-one story. There’s been too much whitewashing of history. There is no question that what we have come to call the Greatest Generation saved the world. They actually did, in fact, save the world. Just like superheroes. But like any well-written comic book hero, the Greatest Generation was flawed. Deeply flawed. The 1940’s were an era of undisguised racism, anti-semitism and sexism. There are cases when returning black veterans were forced to give up their seats on trains - for German prisoners of war. Let me restate that: black men who had fought the Nazis, were forced to give their seats to the very men they’d fought. Japanese-Americans in California were forced into detention camps, their businesses ruined, their property sold off for pennies on the dollar. Jews were still denied entry into many colleges and almost all social clubs. And yet. And yet, these are the Americans who fought the German Nazis, the Italian fascists and the Japanese Imperial Army, and helped to defeat the greatest threat to life and liberty in all of human history. Rio, Frangie and Rainy, along with the many other characters of all genders and races, are typical American soldiers. They march and dig holes; they are sometimes brave and sometimes not so much; they swelter and they freeze; they laugh and cry; they love and hate; they kill, and are killed. They travel a path from their homes to Kasserine, Sicily, Monte Cassino, Omaha Beach, the Battle of the Bulge, and Buchenwald. Theirs is the story of regular people, regular kids, swept into the most terrible of wars. Rio the deadly farm girl, the compassionate Frangie, determined Rainy, flighty Jenou, tall and handsome Strand, mischievous Jack, loutish Geer, dependable Stick, lovelorn Tilo, solid Cat, and more, are imperfect people. They are not always wise. But in this alternate history, they will be part of the army that saved for us the freedom we now have. They will, in short, save the world.